NY Times interview with my favourite Parisienne, Inès de la Fressange. 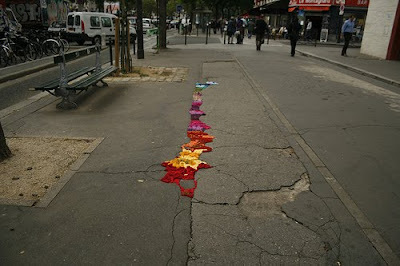 Also, artist Juliana Santacruz Herrera has been performing pothole interventions in Paris by filling them with brightly coloured braids of yarn. 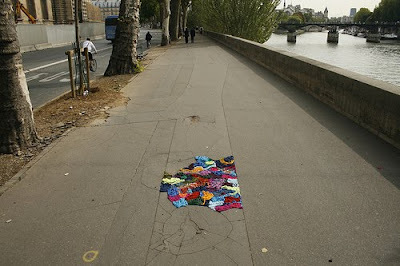 This kind of urban artwork always makes me happy. In general blog news, I'm just four days away from the end of term and will be back online after my last exam. By the way, are you doing anything for the Royal Wedding? I'll be in Canada, but have a little champagne and breakfast spread planned for 5 am. So very excited... I can't wait to see the dress. Sarah Burton/McQueen is probably the last designer I would have guessed Middleton to pick (if the rumours are true), but whoever she chose, I am looking forward to seeing the resulting creation. Posted by la femme at 4:35 p.m. This is AMAZING. Made my day. omg! that's in my nieghborhood! i see those bikes everywhere... it's so funny because could you even imagine the person at home crocheting a bike sweater? i like to think about that. I find your blog so strange and that's why I love your blog !! I like this bike, creative design, best dress for bike! 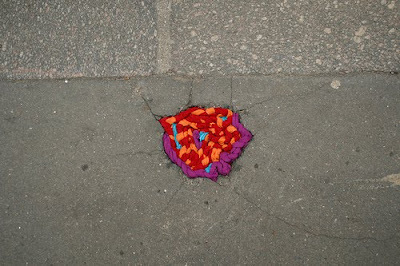 What a lovely way to brighten up a potholed pavement! !